These lightly spiced meatballs are a treat during the summer barbeque months but can also be enjoyed all year round. In a frying pan on a medium heat soften but don’t brown the onions in 1/2 a tablespoon of olive oil. When nearly ready add the garlic. Once the onion is translucent add the curry powder and smoked paprika, cook for just 30 seconds to open the flavours and then remove from the heat. Remove the crusts from the bread and blitz in a blender. Place the minced meat in a large bowl and add the onion, garlic and spices. Combine well with your hands. Add the egg yolk and breadcrumbs and combine thoroughly. First divide the mixture into 16 even pieces and then shape into balls about the size of a gobstopper. Place on a tray and cover in the fridge to firm up for about 20 to 30 minutes. Wash your hands well after handling the raw meat.Heat the oven to 180°C/350°F/Gas 4. 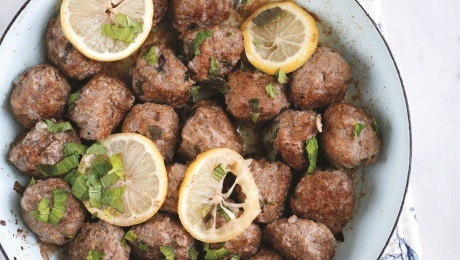 Heat the oil in a frying pan over a medium heat and add the meatballs with a slotted spoon. Cook for about 5 minutes until they turn brown. Once browned put them on a baking tray and place in the preheated oven. Remove from the oven and allow to rest for a minute or two before serving, or allow to cool completely before freezing. These can be frozen prior to cooking but make sure they are defrosted in the bottom of the fridge overnight before cooking.